Don't Be Scared, Healthcare Isn't Spooky! Instead, Get Ready! 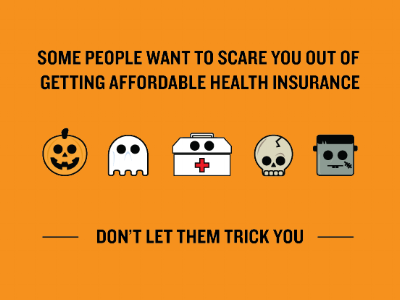 If it's Halloween, then Open Enrollment on the Marketplace (healthcare.gov) is just around the corner! It may also be time for your employer's open enrollment period! For Medicaid and MIChild, you need income information for the current month/year. If you are applying on the Marketplace, you are trying to project your income and household information for next year (2018). Income limits for Medicaid and MIChild can help you understand what you are applying for. 2016 Taxes: Your 1040 form (first page), as well as W-2s and Schedule C or E if you are self-employed. Paystubs: Bring 30 days of the most recent paystubs for anyone who is working. If you don't have paper copies, make sure you can access your pay information online. Self-employment Information: Recent income and expense statement, Schedule C or E.
Do you have a working teenager in your family? Read more about whether or not their income counts at Teens Who Work: Does Their Income Count? For the Marketplace, what matters is your tax household. For Medicaid and MIChild, both who is in your tax household and who is living in your house are important. For everyone in your house, you need certain documents. Social Security Numbers for everyone in the family who has them. Home and/or mailing addresses for everyone in the household. Dates of birth for everyone. Does your employer offer coverage? What does it cost? Your employer can fill out this form to help decide if your employer coverage is affordable and meets minimum coverage standards according to the Affordable Care Act: Employer Coverage Tool. In some cases, employer insurance may be affordable for the employee, but not for the rest of the family. Contact the WHP for help in that situation. Want Help? We are making appointments now, so call 734-544-3030.